The pocket plate design, combined with the Nickel-cadmium (NiCd) chemistry and valve regulated technology, places the EnerSys PowerSafe VGM Ni-Cd Batteries in the lead with low maintenance batteries. The Ni-Cd chemistry provides exceptionally long life at extreme temperatures while the inherent extremely low maintenance feature is enhanced by the valve regulated design, making the Ni-Cd series of batteries an ideal choice for mixed load applications. The robust design provides an excellent resistance against electrical and mechanical stress, low risk of terminal degradation and a proven 20 plus year life. This combination along with proven use in service make the EnerSys PowerSafe VGM Ni-Cd Batteries the right choice for industrial applications, proven reliability and the highest safety integrity. 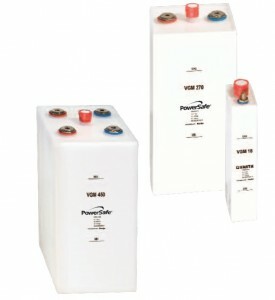 The PowerSafe VGM battery series covers discharges of 30 to 120 minutes. Cell types available in the EnerSys PowerSafe VGM Ni-Cd Battery Series (number indicates AH Capacity). call 800-876.-9373 or email sales@power-solutions.com.